Glo being one of the popular telecom network in Nigeria introduced a new package after seeing what their opposite Networks (MTN, Etisalat) are doing. The decided to follow suite in order to gain more customers to themselves. Now, the order of the day has been that Glo is out to serve their subscribers well with a newly offered services. The newly launched package from Glo network is called Talk special, even as that they went as far as upgrading three of their other products which were recently launched earlier. For the newly package which was introduced by Glo and as such called Glo Talk Special was made to be a package that can always give you six times value of the recharged amount you made. And the package was carved out for most subscribers who make use of talk time mostly than use of data. 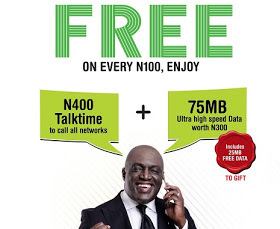 This special discovery by Glo network to their customers also go a long way in giving subscribers add up data that can be gifted to other Glo customer for free of charge. For example, when you subscribe with N100, Glo will give you N400 talk-time to make call with all networks and data of 75MB which worth N300. The data 75MB includes data of 25MB which can be gifted to friends and family. With this new package called talk special, you can make a long period of call with N4000 free airtime and as well use over 500MB bonus just when you recharge your line with the sum of N1000 only. How Can I Migrate to Talk special On My Glo Sim? You can migrate to Talk Special by just dialing *303# then choose any of the bundle presented to you, depending on the one you like. How can I make use of the reloaded twin bash? You can get the reloaded twin bash package by recharging your Glo line with this used code just in this format, *223*PIN# or this *303# after that, you are now subscribed to the bundle package. This very package as well was improved to give Glo customers free talk to time. Out of the first reloaded which is twin bash package was made to be six times value but this particular one (Campus Booster) was made special as it gives the subscribers eight times more value for the already existing data sub, While browsing within the campus. That is to say, for instance, for N200 data plan, the subscriber getsnm 200MB of data for off campus, and in campus 400MB data and with extra talk time of N50 to call any network. How can I subscribe to the data plan? To subscribe dial *777# and then select campus Booster plus voice plan. Lastly, Am happy to announce that Glo increased their data plan to 5GB, that is the one of N2500. The price still remains the same, with the duration of 30days (one month) Dial *777# to subscribe. If you have any question related to the above development kindly ask with the comment box below and within 24hours, you will get our response.